Have you recently got your driver's licence? Would you like to be able to go on holiday but still do not have a car? 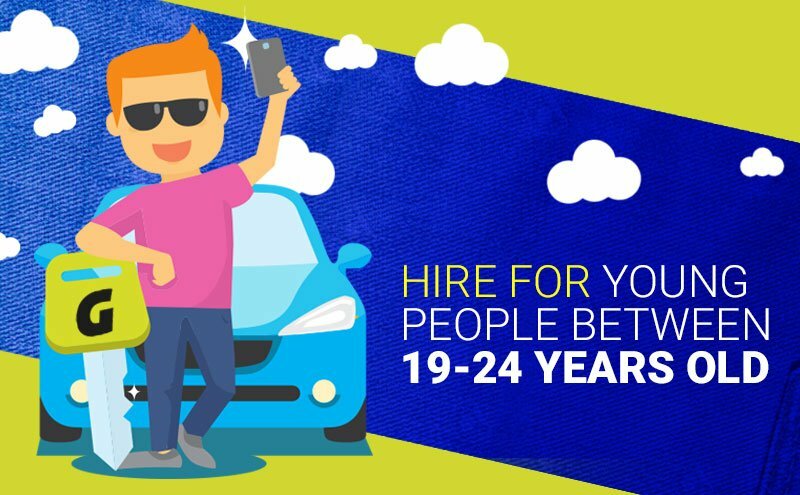 You are very lucky, now Goldcar allows car rental for young people between 19 and 21 years of age if you are going to rent a vehicle in our offices in Spain and Portugal. Do you want to take a student trip? Enjoy a road trip with friends? Find the best deals on cheap renta car? With Goldcar you can travel from any of our destinations in Spain (except the Pamplona office) and Portugal and make your booking for rental car from 22 years of age in all its offices and enjoy exclusive services such as the Key'n go and Click'n go to avoid having to wait in queues of any kind. Do not wait, make your booking now! If you are over 21 years of age you can have access to all the vehicles in our fleet. What is the minimum age to rent a car with Goldcar? The only requirements to rent a car with Goldcar are to be 19 years old and with a licence at least one year old. Take advantage of discounts and other unique benefits thanks to our points system. Remember that if you are a member of our club you will receive a small gift. Big surprises are waiting for you. Find out more destinys like Spain, Italy or our offices in the most tourist islands. You no longer have an excuse not to travel, head away now for your holiday break. Unlock your student discount at Goldcar to Hire a car with Student Beans.